Seriously. 90% of all copy sounds the same. It’s predictable, bland, vanilla. 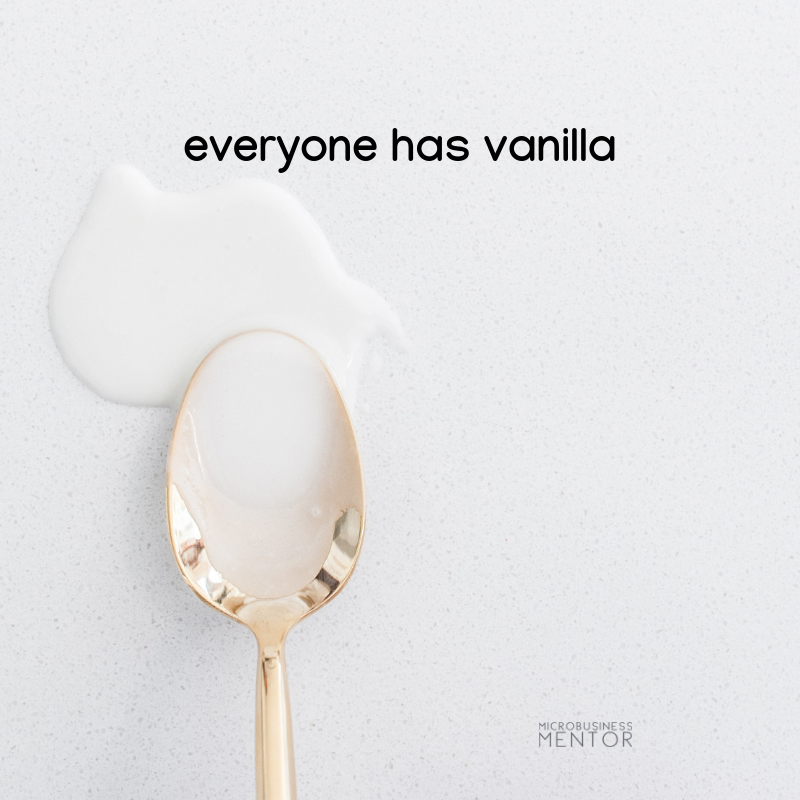 Vanilla is okay…if you have some seriously scrumptious toppings on it or a fabulous pie right out of the oven. But vanilla by itself is forgettable and always overlooked. Think about it. When you’re pushing the cart down the ice cream aisle, you usually are scanning for the most interesting flavors. No one stands with the freezer door open debating between Vanilla A or Vanilla B (boring). No! We’re deciding between Purely Pecan Bliss or Decadent Triple Chocolate and Salted Carmel Delight! Vanilla is basic and will always be there for us, but it’s not intriguing. If you’re going to start an ice cream company you are certainly not going to make vanilla your flagship flavor because you will never be found among the hundreds of other vanilla ice cream choices. EVERYONE has vanilla ice cream. Vanilla is, well, vanilla; and vanilla copy is forgettable copy. Sure, you need the basics in your copy but unless you add some flavor to it, no one is going to read it because you’re sounding like everyone else. If you want to be like everyone else – go for it. You may be thinking that if everyone else is writing plain-Jane copy, then it must work. Sure, it’ll work to a degree. You’ll be average, a C-player in your field. Why do most people stick with plain copy? Because it takes less effort and they equate basic, stoic copy with professionalism. If you are talking to a bunch of high-brow folks who like “just the facts, ma’am” then plain copy with impressive-sounding words are perfect! Yet most professionals are not marketing to high-brow folks or other professionals in their industry. They are talking to p-e-o-p-l-e. People who honestly don’t care about all the letters next to your name or your high-achievements. Want they want to know is if you’re going to take care of them. genuinely care about their clients. And you don’t do that by SAYING that. It’s like someone telling you that they love you versus them showing you that they love you. My heart beats faster when you’re around. I was thinking about you all day. You’re my favorite person to be around. Basically, to remove the WA-WA-WA from your copy, write like you’re talking to a real person. You know, like you’re sitting across the table from them in your favorite cafe. Should you put all that boring, vanilla information in your copy? Possibly, if it’s needed, but it’s not the focus of your copy. Use a bullet point or number list for basic information. Create a link to a separate page with all the WA-WA-WA stuff. Offer a download with any extra and yawn-worthy information that you want your readers to have access to. There used to be a time when stoic, stuffy-sounding copy was impressive to the average person. Businesses were trying to be important-sounding and come across as smarter than their reader. Those days are quickly fading away. Casual writing, even among businesses, is preferable because no one wants to feel talked down to anymore. Instead, folks want to connect with a business or service on a more emotional, personalized level. It’s real. Authentic. People want to do business with real people. Be yourself by thinking about what you would want someone to say to you. Don’t want to write your own copy? If the idea of casual copy that’s engaging and intriguing piques your interest, then let’s talk. I don’t use fancy words or clever phrases. Nor will I write like a Ph.D. or as if I’m trying to impress. What I will do is put myself in your reader’s shoes, think about what’s going on in their head and heart, and write about how you can meet those needs and desires.